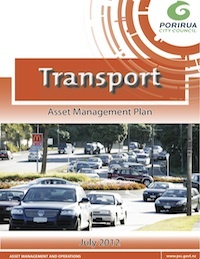 The Porirua City Council – Transport Asset Management Plan is available here. The TAMP covers the whole-life cost approach, life cycle delivery, asset knowledge systems, the organizational structure, risk, and financial requirements associated with asset management. The plan details the relationship between the TAMP and other agency planning documents, distinguishing the asset management plan as a document that links Council inputs, such as community outcomes, levels of service, regional plans, and growth projections, with other planning efforts. This document includes the following sections: Asset Valuation, Data Management, Financial Plan, Future Demand, Introduction, Levels of Service, Objectives and Measures, Risk Management.